The Pilgrim, the Tourist, the Flaneur (and the Worker) is the fourth and final part of the Play Van Abbe programme. The exhibition presents a selection of important works from the museum’s collection together with several guest artists. Visitors are invited to play a role whilst visiting the museum; the roles are the pilgrim, the tourist, the flaneur and the worker. By offering these classical roles, the museum seeks to focus directly on the visitors themselves and the way they experience art, rather than to thematise the artworks themselves. The museum focuses on the criteria that visitors often use to make judgements about art. These criteria have become more complex and uncertain over the last years and are certainly no longer limited to the old measures of beauty and truth. The title of the exhibition describes possible roles that a museum visitor can play when looking at an artwork or exhibition. Each of these roles experiences the museum in a different way and each will have their own ‘tools’ to explore the museum. Roles are never fixed and visitors can change them during their visit, or revisit rooms in a new character. Neither do they represent a hierarchy of experience and, in fact, each might be said to fill a lack in the others. On a spiritual journey, the pilgrim seeks revelation through contemplative observation. In contrast, the tourist takes a break from daily routines, and looks for the experiential and authentic. Wandering without a goal, the flaneur is open for everything while committed to nothing. The more active position of the worker can be approached from any role. The worker is the producer of new stories and meaning, and in this role, the visitor can leave behind feedback and commentary for those who come after. The roles are not meant to clarify whether something is good or bad art, but open up new perspectives for a visitor on the artworks, the exhibition and the museum as a public place for experience and exchange. Featuring works from the collection from Gerrit van Bakel, Georg Baselitz, Joseph Beuys, Marcel Broodthaers, James Lee Byars, Sarah Charlesworth, Thierry De Cordier, Robert Delauney, Braco Dimitrijević, Marlene Dumas, Barry Flanagan, Hamish Fulton, Douglas Gordon, Jenny Holzer, Anselm Kiefer, Richard Long, Klaus Mettig, Piet Mondriaan, Deimantas Narkevičius, Pablo Picasso, David Robilliard, Martha Rosler, Allen Ruppersberg, Katharina Sieverding, Ulay / Abramović, Jan Vercruysse, and Andy Warhol. Special guests in the exhibition are Erwin van Doorn with Inge Nabuurs, Surasi Kusolwong, Cristina Lucas, Oliver Ressler, Marko Peljhan en Yang Zhenzhong. Charles Esche, Christiane Berndes, Galit Eilat, Diana Franssen, Steven ten Thije. 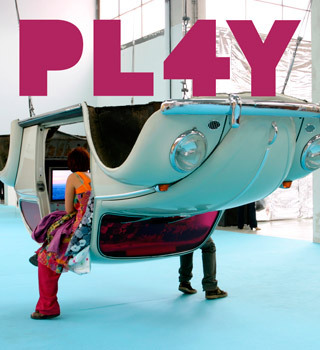 Play Van Abbe has been realised in part by contributions by the BankGiro Loterij, Province Noord-Brabant, Mondriaan Foundation, SNS REAAL Fonds and VSBfonds. Courtesy the artist & Palais de Tokyo.